Often when I ask another pastor who his church is trying to reach, he gives me a very spiritual answer—lost people. It sounds good, but it usually means the pastor has a very fuzzy view of his own community. When I was in seminary, I was taught I had to understand the culture of the New Testament before I could understand the message of the New Testament. If I understood the culture that the New Testament was set against, I could extract the timeless truth from the text. Every biblical preacher does that when he preaches a sermon. But I was never taught to exegete the community where I serve. That’s what targeting is. I should know the geography, customs, culture and religious background of my community as much as I do about the biblical times. 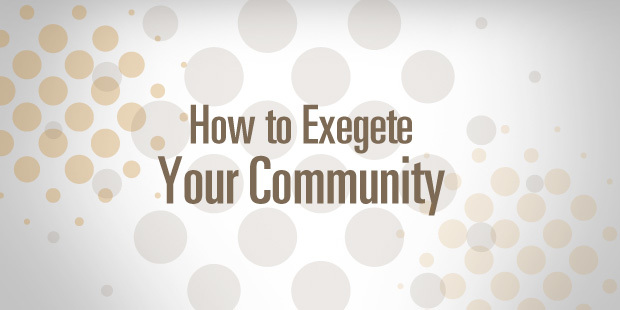 You can’t faithfully communicate God’s Word until you exegete your text and your community. So what about your community should you know? I’d start with these four areas. Its geography. Simply define where the people you want to reach live. Get a map of your city or area and mark where your church is located on that map. 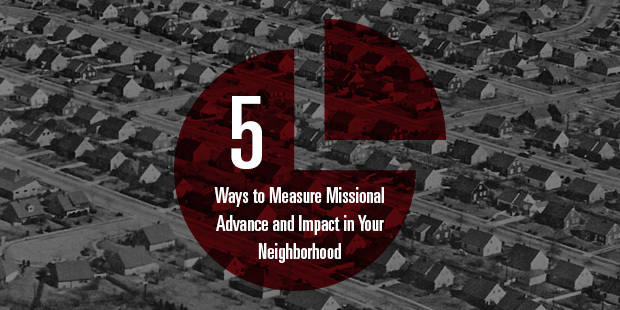 Estimate a 15 to 20 minute drive (reasonable driving distance may be a bit different in your community) in each direction from your church and mark those as borders of your primary ministry area. This is your “evangelistic fishing pond.” You may have people drive a couple of hours to get to your church. But most of the people who’ll attend your church will live nearby. By the way, your “fishing pond” will likely expand as your church grows. Its demography. You need to know who lives in the area you’re targeting. Not all demographics will be helpful. I’d focus on a breakdown of these stats: age, marital status, income and occupation. Other stats are interesting but won’t make a difference in what you do in your church. Don’t overdue demographic research. Its culture. No missionary in foreign lands would try to evangelize without understanding the culture. You shouldn’t either. You can’t learn it from studying census data either. Looking for the values, interests, hurts and fears of people means you have to talk to people in your community! Its spirituality. 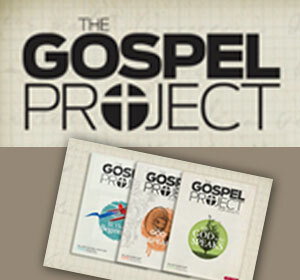 Try to determine what the people in your community understand about the Gospel. Other pastors are often the best source for this. When I started Saddleback, I wrote a letter to all of the evangelical pastors in the Saddleback Valley and asked them some basic information about the spiritual background of the community. I got some great insights from that! Want to know how to discover information about your community? Contact an Auxano Navigator for details. When Tragedy Strikes Your Community, Will Vision Direct Response? Several years ago, I was leading a group from our church in the formation of a launch team for our first daughter church plant. 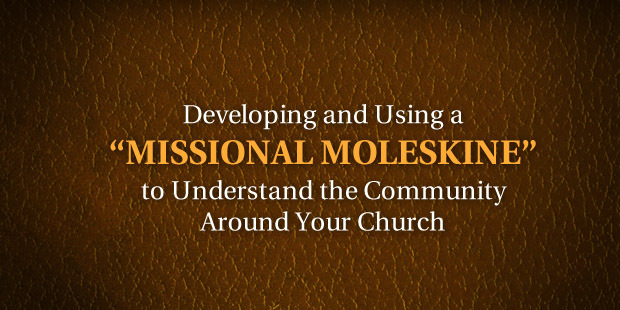 In my series on “cultivating community contacts,” I shared about the “missional moleskine” (not to be confused with the memory moleskine). info from conversations about their life, beliefs, and experiences. Once I have gathered this information, I leave room in my journal for future encounters. For example, if I cultivate a relationship with a server at a restaurant, I will schedule my eating around their work schedule and attempt to connect with them on a regular basis, building on the previous encounters and conversations. Each successive encounter would be dated and filled out, creating a chain of commentary hopefully leading to progress in loving them and leading them to Jesus. The end result is to chronicle the movement around the mission as we cultivate relationships with unbelievers and seek to sow the good seed of the gospel in their lives as a faithful witness and relentless commitment to advancing the cause of Christ. Other benefits include specifics for ongoing prayer and intercession and research/reflection for cultural exegesis, planning, and corporate strategies. I am focusing on making disciples through a renewed relational investment plan, and with that plan, and am reincorporating the missional moleskine with a few tweaks. The big thing I’m focusing on this year is incorporating “place” and “progression” in the investment “plan“. My goal is to see the missional moleskine turn into a travelogue for life in the city. It is tracing life on mission at home (first place), at work (second place), and in the community (third places). Living as a missionary is not about being special or additional but intentional, and the missional moleskine helps me map that out. By progress, I am talking about the establishment of relationships with non-Christians and investing in those relationships progressively over time. It is common knowledge that the majority of people whose lives are transformed by the gospel do so through a relationship. For me, this is ground zero for living on mission. While this may sound really elementary and basic, the starting point has to be an honest one. The second category–Congregational Christians–is similar to the first group, except these individuals at least have some connection to congregational life. They have a “home church” they grew up in and perhaps where they were married. They might even visit occasionally. Here again though, we would say that these people are not practicing any sort of real, vibrant faith. They are attendees. This group makes up another third of the 75 percent—or about a quarter of all Americans. If you look at church history the increase of the "church" and the perception of its power were always linked. If people wanted to climb higher in life and "being" a Christian would help they became Christian. People will become what they need to become to gain power and prestige. As America embraces a "No harm no foul" hedonistic attitude of life and Christian begins to have a stigma to it I can see congregations shrinking. Those of true faith are standing strong but those that are like the sports fan that cheers for a different team when theirs becomes unpopular are bailing. I think it's ironic though that many of those that we should have been ministering to for Jesus were sitting in the pews next to us. The church I attend in Haiti will study a new member and reassure themselves that they are a believer before they will allow them to take communion. Once they are confidant you truly believe then you are given a card that you give over before you take communion. In America a pastor may say. "Come and take communion if you have a relationship with Jesus," I'm sure there are many that do because everyone else is. A greater personal involvement with and between the members can help bring those that are sitting right in our camps to the cross. Great article as usual from Ed. Christianity Today calls it “the craziest statistic you’ll read about North America missions.” What is it? One in five (20%) non-Christians say they do not know a single Christian. Nearly 13,500,000 people in North America do not know a single Christian, much less have a relationship with them. Even more startling, if you remove the number of non-Christians who once professed to be Christians, the percentage increases to 60%! If we are going to reach our world for Christ, we have to embrace the Great Commission with a comprehensive vision to see strangers become missionaries. As I argued in my original article, churches can give the appearance that they are experiencing growth when in actuality they are merely adding already churched members through transfer growth, representing a very small percentage of people in most places. We can no longer tolerate the naive assumption that non-Christians will be attracted to our gatherings or that they will become religious consumers of our spiritual goods and services. They want community, not consumerism; authenticity, not activities. The greatest apologetic for those far from God is showing and telling them a better story–stories of lives changed by Jesus and compelled to love others as Christ as loved them. Picking up from a previous post, I want to add some additional practical ideas to encourage follow through. We need an honest and realistic starting point. It hit me hard in the gut to realize that I was busy doing “the Lord’s work” while failing to know, much less lead, any “strangers” in my city to Jesus. It is easy for us to look at people and see the color of their skin, how they dress, what car they drive, etc. without acknowledging that they have souls that will never die. The present reality is a spiritual reality: the massive majority of people in my world are rebels and traitors, not sons and daughters of God. The present reality is a missional reality: the massive majority of people far from God do not seek God nor is there fear of God in their eyes (Rom. 3:10-18). The present reality is relational reality: the massive majority of people in my world do not know a single Christian. They are strangers to God and strangers to Christians. The present reality is an evangelical reality: what strangers know about God is very likely to be misguided or ill-informed and their understanding of the gospel message darkened. Paul says we should “continue steadfastly in prayer, being watchful in it with thanksgiving” (Col. 4:2). What are we looking out for? Paul assumes that believers who pray in faith are going to have their eye on what God is going to do in answering their prayers. A life devoted to prayer is a Godward orientation that confesses our neediness and accesses God’s provision. Perhaps nowhere is that more applicable than engaging strangers to see them become disciples of Jesus. As we walk toward outsiders, we look toward heaven for God with a watchful eye for how He’s going to work in our lives. Right after the call to watchful prayer, Paul requests prayer for himself and fellow co-laborers. He specifically asks for open doors of opportunity to preach the gospel and an open mouth to speak boldly and clearly the message of who Jesus is and what Jesus has done. Christians on mission, praying kingdom prayers, will be looking to see how God is making His kingdom come and will being done on earth and in their lives as it is in heaven. Jesus works in circumstances because He is sovereign; Jesus works in us because He is our shepherd; Jesus works in sinners because He is the Savior who speaks with the voice that raises the dead. Praying, believing, and watchfully expecting God to work will change the way you go about your daily life. Our default position, regardless of our limitations, is to highlight our inadequacies. ‘This kind of life and mission does not apply to me because of _________________.’, ‘I cannot live this out because _________________.’ I don’t want to minimize the merits of our weaknesses or struggles; in fact, I want to highlight them. God uses weak people to display His strength. God uses our struggles to work His power. We need to highlight God’s sufficiency to fill our inadequacies. The Bible says the Spirit of Him who raised Jesus from the dead dwells in us (Rom. 8:11). The Spirit raised Jesus from the dead. How big was that?! That same Spirit dwells in you. What’s so big in our lives that the Spirit who dwells in us cannot address? We don’t go into the world to make disciples as if Jesus was not risen from the dead; we go because we was risen and ascended into heaven and given us His Spirit. You will be My witnesses, Jesus says, when the Holy Spirit comes upon you. The guarantee of our usefulness in God’s kingdom work is manifested by the Spirit’s power in us to do what is beyond our abilities. If we live in our strength, we will fail. If we rely on our own resources, we will give up. We can lean forward on mission when we lean in to the Spirit. In our humble dependence, God accomplishes His good work in us and through us. Don’t let your circumstances outwardly, or inadequacies internally, keep you from being used by the Spirit eternally for the welfare of strangers far from God. Jesus called Twelve. He commissioned 72, sending them out two-by-two. Jesus knew that we need the support and accountability to stay the course. Submit your plans and ambitions to the Lord and to others in your gospel community to support you in prayer, join you in the work, and encourage you when it seems like nothing is happening. Maverick Christianity is not biblical Christianity. We are a family on mission. We may not all be engaging the same people because our rhythms may take us difference places in different ways to difference contexts. But we are all on the same team, all having the same mission and goal, and we need one another. If you are looking to flesh this out among believers who are not making disciples, you will likely have to start alone if no one wants to do it with you. But pray that God will use your example as a catalyst to mobilize others for mission. Often times people don’t know what life on mission looks like until they see it lived out. Blessed are the merciful, for they shall receive mercy. Those who get the mercy of God will be dispensers of the mercy of God. Pharisees don’t get messy because they don’t see their sin and need for mercy. Sinners saved by grace are equipped with the same mercy they received to live as ministers of mercy toward others. That means you don’t engage strangers who qualify by their self-righteousness to become your neighbors. Knowing how God has dealt with you so compassionately, you freely give yourself to get messy in the lives of strangers and not shrink back because of their sin or rebellion against God. Do I really believe that God saves sinners? That no one is beyond the reach of God’s grace? That where sin abounds, grace can abound all the more? That the Holy Spirit is the Great Evangelist? That the gospel is the power of God unto salvation for ALL who believe? Then a right understanding of God and His gospel will motivate us to get messy. Jesus came for those who are sick, not those who are well. Good news for us is that a whole lot of people qualify. The fields are white unto harvest! Do You Have a Strategic Operating Plan? Knowing these limitations, why not come up with a plan on how to leverage your relational margin for the sake of gospel advance? How many relationships could be acquaintances? Neighbors? Friends? You can’t change the world with 500 relationships, but you can change a neighborhood with 10. I fear the problem with most of us that we have failed to consider these limitations and leverage our relational margin at all for gospel causes. To correct that, we need to begin with examining our relationships and make efforts to demonstrate personal hospitality, receptivity, and availability for God to use us in the lives of others. A key factor with many of us is that our lives are too complex and too busy. We simply don’t have time. Does life have to look like a rat race or exhausting treadmill? I don’t think so. Five years ago I wrote about being too busy not to evangelize, and I followed up with some ways to create missional margin in your life. Woody Allen once said that 80% of success is just showing up. We need to be present, and present with a purpose to live with others, love them, and lean into the kingdom under the leadership of the Spirit to magnify Jesus. One of the most practical ways I try to chart movement is through my missional moleskine. This is my city travelogue in which I journal my way into the lives of others, asking God to use me through rhythms of life in ordinary ways to impact ordinary people with the amazingly good news of Jesus Christ. It could be a prayer, a gospel conversation, learning their story, or simply being present and letting them know I want to be a part of their life (and doing so not in a hurry or looking at my cell phone!). Whatever you use, it is important to measure movement in the same way you journal prayer requests and how God answers them. Looking back, you will be filled with gratitude that God uses little things, little moments, and “little people” to accomplish His work. This may not sound practical, but it is probably most practical of all. You see, we know who we are when we are in a church gathering. We are worshippers of Jesus. But our identity as a worshipper, disciple, servant, and missionary does not end when we are not in a church gathering! The reality, however, is that we have an evangelical norm where our identities in Christ are nonexistent in the normal course of life so that we go about our daily living forgetting who we are. When I’m in a cross-cultural context like I was last week (Haiti), I am reminded constantly that I am a missionary and a servant. It’s obvious. But why isn’t that so obvious in my hometown with my own people? Could it be that I’ve adopted a way of living that recognizes Jesus in emergencies or mountaintops but forgets him in the daily grind? Isn’t that where I need Him most and need to be reminded of who I am because of what He did for me? Let’s face it. The world is an intimidating domain of darkness. It lies in the power of the evil one. We are faced with temptations from within and trials from without. The easiest thing to do would be to find a “safe” place and hunker down until Jesus returns. The unfortunate reality, however, is Jesus does not present that as an option for His people. We are a city on a hill whose light cannot be hidden. We are His ambassadors with the message of reconciliation. Instead of fearing the world’s influence on us, we should carry on in faith, constantly reminded of the Father’s providence for us, the Son’s purchase of us, and the Spirit’s power in us every step of the way. The Lord is my light and my salvation! Whom shall I fear? Jesus knew what it was like to be on mission and experience heartache, disappointment, and betrayal. Paul knew what it was like to make it his ambition to preach the gospel where Christ is not named only to end his life confessing that everyone there had turned away from him. Jesus finished His mission. Paul kept the faith and fought the good fight. We cannot think that investing our lives in others for the sake of the gospel will come without pain, hurt, and heartache. It’s going to happen, but we cannot shut our hearts and shut down the work. Persevering in the mission comes when we understand how much and how deeply we have been loved by God. Only the gospel can fuel you with motivation to pick up the pieces of a broken heart to love lost, broken, rebellious sinners the way God loved you. In your kindness, God works to bring them to repentance. Church Renaming: A New Coat of Paint or a Re-Envisioning? Over the past month, many people have heard about my “Jericho Road Moment.” That story is part of a bigger story this year where I’m praying and pursuing God’s kingdom work in my neighborhood and city with renewed initiative and intentionality. Over the past couple months, I’ve been working to gain greater clarity on how to make that happen. 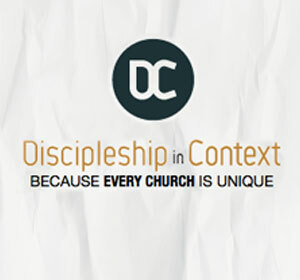 Jesus commissioned His disciples to go into the world and make disciples. I believe, first and foremost, Jesus is speaking of cross-cultural engagement of unreached people groups. The thrust has an expansive, horizontal dimension no doubt. But, I also believe that the making of disciples has a depth dimension as well. Even in “reached” areas of our cities, there are many unreached and unengaged people. Let’s be honest: What percentage of our city is unengaged with the gospel? What percentage of people have any proximity to the kingdom of Christ? In my city, we have 165,000 people. The best research I could find is that less than 10,000 belong to any church. That means 155,000+ people need the gospel of Jesus Christ. We dwell in the same city, but for all intents and purposes, they are strangers to me and every other Christian and church. When we are not on mission, the way a church “grows” is by shuffling some of the 10,000 when things don’t work out (transfer growth). It may give the appearance that we are reaching our city with the gospel when in reality we are simply receiving Christians who are either new to the area, or done with their previous church. We are skimming the surface with no missional depth to genuinely engage the city, evangelize the lost, and establish new disciples in the faith. Here’s a helpful diagnostic to consider. How many non-Christians do you know on a first-name basis? How many of them would consider you a friend? What percentage of your relationship investments is with those who do not know Jesus Christ? How accessible are you to those in your world who do not know God? If the members of our church cannot, off the top of their heads, list 3-5 unbelievers they know, then we have missional atrophy. If the overwhelming percentage of relationship investments of church members are with other Christians, then it has become ingrown. If there are not pathways for pursuing those far from God in our lives, then we have put the Great Commission on the shelf to collect dust. 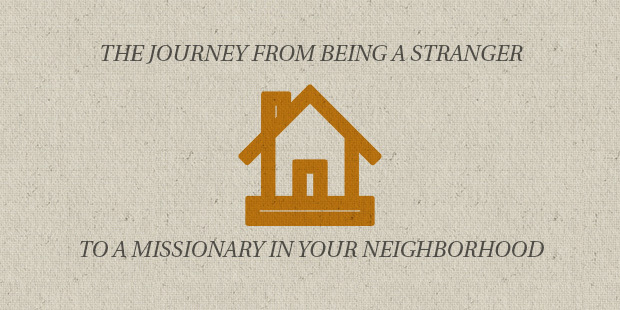 » Strangers need to become Neighbors through missional intentionality. » Neighbors need to become Acquaintances through incarnational integrity. » Acquaintances need to become Friends through relational investment. » Friends need to become Family through evangelical invitation. » Family needs to become Missionaries through practical instruction. When I begin, everyone outside of my church family are strangers to me. But when movement takes place, some will become neighbors. Over a period of time, and as deeper engagement takes place, more and more neighbors will become acquaintances, then friends, and then fellow brothers and sisters in Christ who are trained to repeat the process. All of this, in my opinion, is discipleship. If we are going to make disciples of Jesus Christ, we have to go after “strangers.” Strangers, those far from God, will not be attracted to our Churches attractional efforts or events. We must go to where they are by pursuing them. This begins by having an intentional approach to ordinary living. If we are threads for kingdom fabric, we are to be woven into the heart of the city with everyday rhythms and networking strategies that introduce you to strangers and invite them to become neighbors. These rhythms include where you eat, when you play, how you shop, etc. The networking strategies have to do with purposeful attempts to connect with people on a repeated basis. (I will tease this out more in a follow up post). > Strangers become neighbors when they know who you are and you know who they are. But the knowledge at this point is very superficial. A neighbor becomes an acquaintance when you begin to have a shared life through the integrity of your incarnational efforts. By that, I mean the sincerity of your words and consistency of your actions create a plausibility to neighbors that gives permission to share life through regular greetings, short conversations, etc. > Acquaintances become friends when you make an intentional investment so that the rhythms of life with other people sync up so that a shared life is more than a casual conversation. You are in their homes, and they are in your home. You connect on a regular basis. They open up to you in ways that you understand the story of their lives, and as a good listener, learn how the story of the gospel can find redemptive bridges to cross into their world. > Friends become family when you naturally share with your friends who you are and what is most important to you. You tell them your story and how God has made you new. And through the relationship investment, your friend feels safe asking questions and bringing up objections knowing they are not a project to fix or a sale to make. By seeing the impact of the gospel in your life and sharing the good news in everyday evangelistic conversations, friends are invited to brothers and sisters through repentance and faith in Jesus Christ as Lord. > Family members become missionaries when they walk with you through life-on-life practical instruction on what it means to follow Jesus. They become fluent in the gospel and shaped by the reign of Christ when seeking first the kingdom of God. And they wrestle with the struggles and share in the successes together with you while joining you as a missionary in their neighborhood and city. There are two main aspects of this strategy that I want to highlight. First, you notice that most everything happens outside the main structures and/or events of the church. I am all about church gathered and recognize the need to do attractional church well, but very little Great Commission advance, in my opinion, is achieve by the “come and see” approach. Second, some may argue, “Why don’t you just preach to strangers and see them trust Christ then and there?” In other words, why don’t you go straight from stranger to family? From my experience, this kind of leap truncates discipleship and make converts, not disciples the goal. I have seen little lasting fruit from evangelism divorced from relationship, presence, and service to the community. As I plan out my missional engagement to make disciples of Jesus, I want to evaluate the percentage of my relationship investment for gospel advance. How many strangers have become neighbors? How many neighbors can now be considered acquaintances? How many are moving toward becoming friends? Friends to family? Family to missionaries? Where there is no movement to go deep in the community, we will relegate the Great Commission to the swapping of sheep instead of making new disciples of Jesus. We are to be a pioneering people, not a privileged people. Let us go as those who are sent and preach as those who have a saving message, and love as those who have been adopted by our heavenly Father. 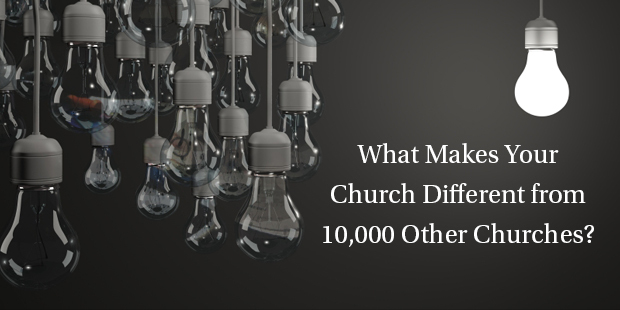 What Makes Your Church Different from 10,000 Other Churches? God has given your church a specific place and people to minister to. There is no other church in the world exactly like yours, equipped to serve God and your community exactly the way He intends for you to do it. To borrow a phrase from my friend, David Putman, you’ve got to break the missional code of your community. David co-authored the book “Breaking the Missional Code” with Ed Stetzer. In a nutshell this says that you need to find out specifically what it is that your community needs and be that for your community in order for them to be receptive to the gospel. Our partner Auxano states it in a question: What makes your church different from 10,000 other churches? Find out what this is for your community and then go be it. Rick Warren was successful with his church model in his specific community in Southern California, but that doesn’t mean you will be successful with his church model in your community in rural Tennessee. Understanding this should give you a sense of relief and freedom, and it should transform your church programmatically and physically. Understanding this will help you see how you can employ intentional and strategic design to best utilize your site and facilities to become the heart of your community. If your architect or design-builder brings you a set of “stock” plans to pick from (or a set of plans that might as well be, because it looks just like every other church you’ve ever seen), just remember, you get what you pay for, and what you get may have worked for the first church is was designed for, but you aren’t that church, and it may not work for you or your community. Now what I’m NOT saying is that every project has to be designed from scratch. Each project doesn’t have to reinvent the wheel. In fact, to paraphrase a quote often attributed to various artists of different mediums, good architects borrow half of what they design, and great architects steal it all. What this means is there are so many good design elements in existence in both the church and “secular” world and so many well established design “rules-of-thumb” for various ministry programs such that a great architect can draw from a wealth of resources and knowledge of built environments to pull together (“steal”) all the design elements into a cohesive, but still unique, plan that is right for your ministry and your community. Don’t let any architect or design-builder presume to tell you who you are as a church. The great ones will find out what your DNA is and design a solution to meet your specific functional needs as a church…and your missional needs for your community. A great architect will design with the regional context in mind, taking the time to understand what makes a site in Atlanta different from a site in Louisville, or Los Angeles, or anywhere in between. A great architect will investigate and understand the specific opportunities and constraints of your site, and won’t suggest a “stock” plan to plop down on any site and “make it work”. Your church is not McDonalds, so don’t let your building look just like another McChurch down the road. The key thing to look for when seeking out an architect to partner with your ministry is how well they listen to you about who you are and who you are trying to reach, so that with intentionality they can create a design to tell your unique story in the built environment. Partnering with a good architect may get you into a functional building, but partnering with a great architect will help your church “do your own thing” better than you could ever imagine. >> Read more from Jody here. I am the national Vice President of Operations for Visioneering Studios, an architectural, urban planning, construction, design, and development firm based out of Irvine, California with other offices in Phoenix, Denver, Austin, Chicago, and Charlotte (which is where I’m located). Every day is an incredible journey and I’m excited to have the opportunity to work on some amazing projects with some of the most dynamic and fastest growing churches in the country as well as spend time with incredible people both as coworkers, clients, and friends. This is part four in a series on the importance and process of creating an assessment culture in your church. Reading parts one, two, and three of this series may help provide some context for this post. In our book Transformational Church, Thom Rainer and I outline seven measuring sticks that should be a part of the new scorecard of church effectiveness. These were not the seven aspects that we chose personally. 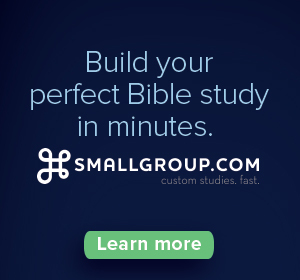 They sprang from in-depth, original research of churches that were seeing God bring transformation and growth to their church body and surrounding community. Today, I want to briefly examine one of those seven measuring sticks, along with a part of an assessment culture that is so foundational we made it a requirement for those churches taking part in our research. These two characteristics are typified by two groups of people presented in Scripture as geographically or tribally praiseworthy: the Bereans and the Issacharites. In Acts 17:10-12, Luke contrasts the people of Berea with those at Thessalonica, who had stirred up a riot against Paul, Silas, and their local friends because they preached Christ as the Messiah. In Berea, however, the synagogue welcomed them and examined the Scriptures daily to verify the missionaries’ teaching. The Bible calls the Bereans more open-minded or noble than the Thessalonians. That’s why you never see a Thessalonica Presbyterian Church. No one wants to be like them. For the Bereans, the Bible was their filter. They tested Paul’s words by God’s Word and found they lined up, so they accepted what Paul said. Before we move to any other aspect of an assessment culture, we need to be Bereans. Our evaluations must start with the Bible. The Word of God is always the place to begin to talk about church and mission. It always speaks with greater clarity and truth than we ever could. Even though it was written long ago, because the Holy Spirit inspired it, the Bible speaks today with surprising immediacy. 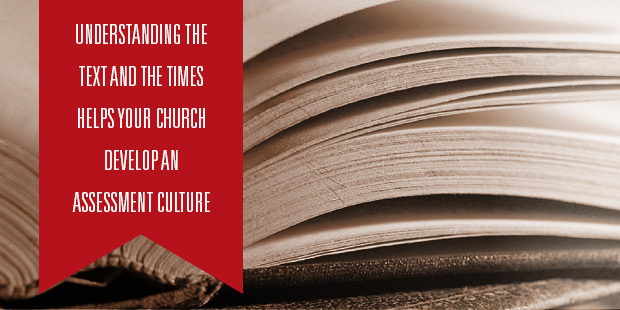 While our churches may be constantly trying to find relevance, the Bible is eternally relevant. As C.S. Lewis wrote, “All that is not eternal is eternally out of date.” Along those lines, one of the great promises the Bible makes is that, though the church often looks and feels rough around the edges, God is always at work in His people. When we started our initial surveying of 7,000 Protestant churches to discover the commonalities of the top 10 percent, we laid out certain presuppositions that must be in place for the church to qualify for the study. Our first-tier criterion included that the Bible is the authoritative guide for faith and life. We wanted to be sure pastors agreed if they were part of the research. Our study was based on churches that would all work out of the framework that Christ is the way to salvation. Scripture was our baseline and our filter. So, for example, if some research indicated that the key to having a growing church is to stop preaching the Bible, we would say that consideration doesn’t fit through the filter. So, the foundational assessment question for your church should be, “Is God’s Word central in our body?” You need to be a Berean church. Secondly, you should follow the example of the Issacharites in 1 Chronicles 12:32 in understanding the times. You don’t hear a lot about the tribe of Issachar. They are not the tribe of Judah or Levi. They seem relatively unimportant, but they’re described as ones “who understood the times and knew what Israel should do.” There is little known about why they understood the times, and we should not read so much into the phrase as if they were a team of missiological analysts or futurists. Some speculate that they were scholars, but it important to note that they did not just understand the Text, but they understood thetimes. To be like the Issacharites, you have to discern the times, so that you can know what to do. A lot of the ways churches minister are similar—they share many of same whats. You will find worship, small groups and mission as part of most churches. Even the how stretches across denominational, generational, and geographical lines with aspects like prayer, leadership, and relationships. But the where creates a huge distinction for churches that are seeing transformation take place. They assess their ministry based on the context in which God has placed them. We have to understand the times. If you are passionate about the people and community where God has sent you, and if you love them as He does, you will be motivated to know and understand the (and their) times. Unfortunately, Christian leaders are often more in love with their methodology than they are with their mission field. Instead, we need to be known as those who understand when and where we are and respond accordingly. I don’t often quote Karl Barth, but I believe he captures the right sentiment in his frequent reminders that theologians and pastors need both the Bible and a newspaper. He told students training for the ministry “to take your Bible and take your newspaper. But interpret newspapers from your Bible.” The Word of God must be foundational for our lives and serve as the grid through which we see everything else, but we still must see other things, including and especially the context in which we minister. 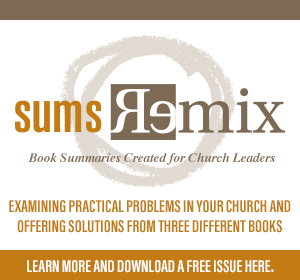 When you create an assessment culture in your church, make sure you are evaluating whether your ministries line up with the Text and your context. 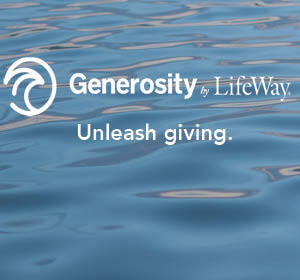 Everything should flow from the Bible, but it should flow through the community and culture where God has placed you. We need to be people of Berea and Issachar. Last week, I talked to you my efforts this year to build a neighborhood in my city through Next Door. This is a heavy burden I have, one that I have not steward very well in the past. The verses above speak about God’s providence, namely that God determines our dwelling places. Have you thought much about that? Yes, you thought you live where you do because of the great deal on the house, the school district, the proximity to work, etc. But in and through all of these secondary causes, there’s a primary cause that you live where you do: God put you there. And God’s providence is not without God’s purpose. God’s purpose in Acts 17 is “that they should seek God…and find him.” So let’s put this together. God placed me in this particular plot on planet earth for the purpose that people should seek God and find Him. And God’s purposes should become the passion of our lives. If God’s purpose of providentially placing me in the city where I live so that people would seek God and find him, then it ought to be my passion to accomplish that purpose. God has a design. He’s being intentional and purposeful. 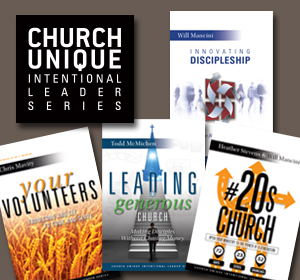 When I embrace that intentional design, my response should be a passionate embrace and acceptance of the mission. Simply put: I live where I live so that those without God can find life in Him. What difference would this make if my life really looked like that? This gets to the heart of loving my neighbors as Christ loved me. When the eternal Son of God took on flesh, He tabernacled among us. He entered into our neighborhood so that we could know God through Him. Christ loved us by coming to where we are and providing salvation for us. If I am going to love my neighbors as Christ loved me, I must seek to enter into their lives, seeking to love, serve, and sacrifice, that they may know God and be saved by His grace. In order to make what I just said real to me, I decided to do a little research on my new neighborhood called Burnt Embers. 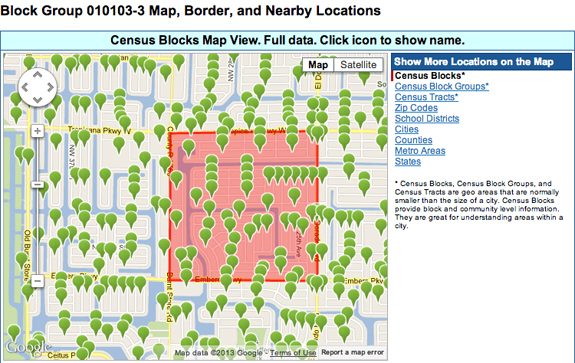 At USA.com, you can view the 2010 Census by city, by tract, by block groups, and by blocks. It’s really impressive – and free. According to the website, Burnt Embers is almost exactly one square mile in size, and after spending a few hours on it, here’s what I came away with. Burnt Embers has a population of 1,316 with ethnic breakdown of 68% white, 25% hispanic, and 7% black. There are 423 households but 540 housing units, meaning 117 houses are empty. Of the 423 households, 334 are family households, 55 are single-person households, and 22 are seasonal households (snowbirds). There are 442 children in the neighborhood (under age of 19), and 120 seniors (over age of 65). 84 households speaking Spanish. As for the adults, there’s a total of 721 with 192 never been married, 442 currently married, and 87 divorced. Burnt Embers is lower-middle class, with a per capita income 40% lower than the national average. 22 families live below the poverty level, and 23% of households live on less than $20,000 a year. There aren’t a lot of deep pockets either, as only 2% of households live on $100,000 or more each year. The majority of the families have a combined income of roughly $47,000 a year, with families having both husband and wife working. 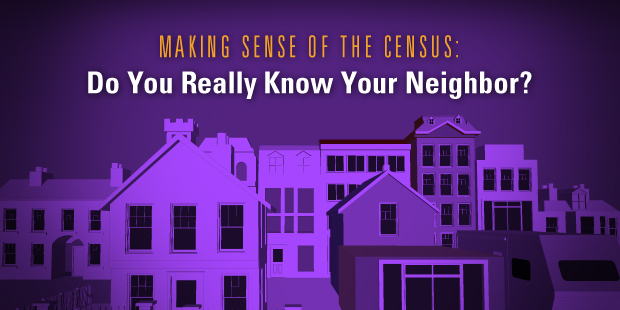 The census give us a whole lot of concrete data about our community. It also tells us where and how it is changing. For instance, almost all of 540 homes built-in me neighborhood were constructed after the year 2000, and within a decade, 117 (21%) of them are empty. That begins to tell some of the story about the foreclosure impact on our community. My neighborhood is largely blue-collar and multi-ethnic. One out of five households speak Spanish. If I am going to connect with them, this says something about my need to understand their culture and language. There’s 442 children in my neighborhood. How can my kids get involved with them? How can I help create safe places for these kids to play and hang out? How many of them have single parents? How many could use tutoring? How are we keeping them safe from crime? » Of the 84 Hispanic families, how many of them need help learning English? Getting a job? » Of the 22 snowbirding families, how many of them could use help around the yard? Taking care of property while they are gone? » Of the 122 senior citizens, how many are alone? Do any need transportation help? What about assisted care for their health? Their home and yard? » Given that most families have both sets of parents working, how are the kids being taken care of? Is child care needed? Babysitters? » Of the 22 families who live below the poverty line, how can the neighborhood contribute to help them with basic needs? Do the adults need to acquire skills or training for better employment? » Of the 117 empty houses in our neighborhood (that’s A LOT if you think about it), what can we do to help them sell? How can we address the neglected foreclosed homes? Does the high level of empty homes open the door for increased crime? These are the kinds of questions that surfaced because of a couple of hours of research. I was not asking these questions two weeks ago because I was ignorant of my neighborhood. It was only generic houses with faceless, nameless people living in them. I still don’t know all their names and faces, but I know a lot more about them now than I did then. I can begin to see the challenges they are facing–socially, relationally, financially, educationally, etc. I can begin to understand the narrative of my neighborhood–where there’s brokenness, where there’s need, where there’s hope and ambition, etc.–and how bridges can be established to intersect the story of the gospel into the story of my neighborhood. I can begin to know how to pray specifically for my neighborhood–for the children, families, elderly, poor, and so on. This all goes back to what I began with. God put me in this neighborhood by His sovereign plan. That plan comes with a purpose–that the 1,316 people here might seek and find God. And that purpose should be the passion of my life. Therefore, I should endeavor in every way possible to commend Christ to them in word and deed. They need presented to them the good news of Jesus by one of His re-presentatives. And having the gospel presented to them by a representative of Christ means that I must be present. And my presence becomes a present (gift) to the neighborhood because it is through the means of the Gospel being shared and shown to them they might seek and find God. My hope is that I will start to take greater ownerships of my own square mile. This is a start, but I have a long way to go. How about you? Have you taken ownership of your own square mile or neighborhood? Are you patterning your life after the providential and purposeful plan of God? Are you passionate about that? Enough to do some homework, ask personally engaging questions, and enter in? I’d love to learn from you. Let’s do deep into our “world” and make disciples of Jesus where we live, because after all, we’re not here by accident. What does Jesus want to say to the church in the West? To the church in North America? To the church in the South, or in New England, or in the Midwest? What does Jesus want to say to your church? 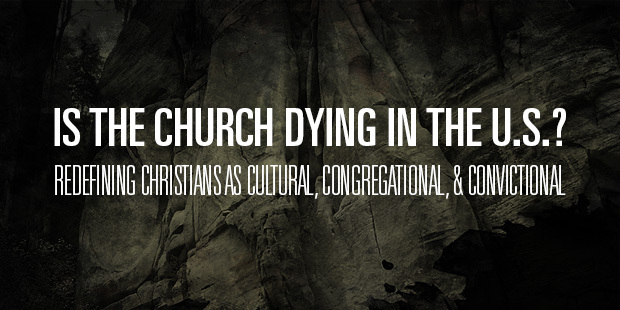 That all depends: what is your church like? Where are you strong? Where are you weak? We live in a big country with hundreds of thousands of churches. If you think the issue out there is too much law, you’d be right. If you think the issue is cheap grace, you’d be right about that too. Jesus wouldn’t say just one thing to the church in this country–let alone in the West or in the world–because the church in this country is diffuse and diverse. If Jesus had seven different letters for the churches in Asia Minor, I imagine he’d have more than one thing to say to the churches in North America. We all tend to see certain errors more clearly than others. Nothing wrong with that, as long as we see our own dangers most clearly and don’t presume that every church has the same problems. 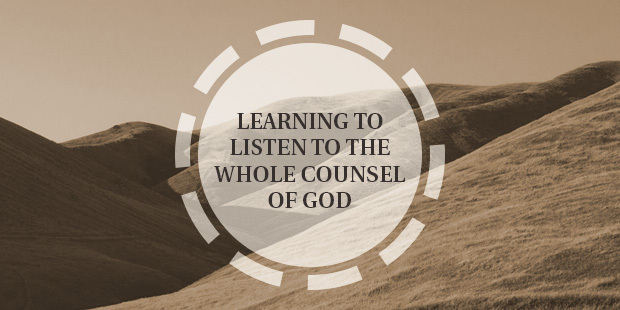 We must pay attention to the whole counsel of God. We need to study all of it and preach from all of it, not just the stuff that hits our sweet spot. God has a word for all of us—if we are willing to look hard enough and willing to listen. I am the Senior Pastor at University Reformed Church(RCA) in East Lansing, Michigan, near Michigan State University. I’ve been the pastor there since 2004. I was born in Chicagoland, but grew up mostly in the Grand Rapids, Michigan area. I root for da Bears, da Bulls, da Blackhawks, the White Sox, and the Spartans. I have been married to Trisha since January 2002. We live in East Lansing and have five young children.